If you squint, you can barely see the work of installing the new breaker between the two transformers at the Hazelwood substation. 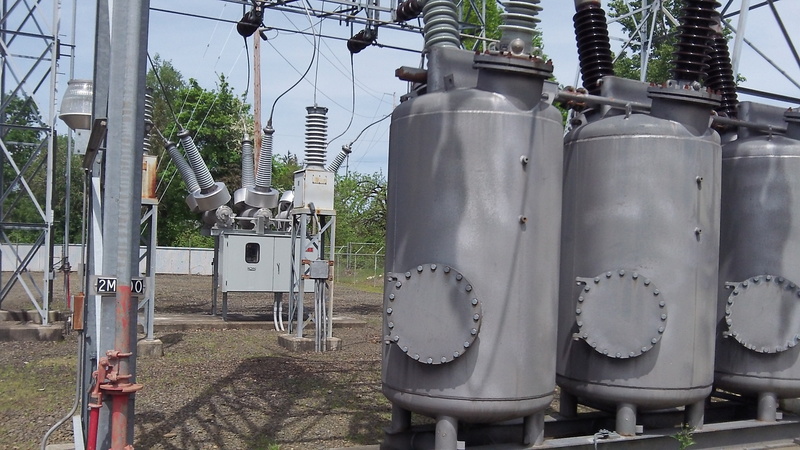 A crew was working at Pacific Power’s Hazelwood substation in West Albany Thursday, installing a modern breaker to replace one that suffered a “catastrophic failure” on Monday afternoon, causing a widespread power outage in Albany and Corvallis. To learn more about the cause, I talked Thursday with Doris Johnson, Pacific’s Albany-area business representative, and James Johnson, the utility’s area engineer for the mid-valley. I also took a bike ride to the substation to take a closer look. That thing with the three tanks is a breaker of the same vintage as the one that failed. Behind it is a newer kind. A breaker on a big substation like that, I learned, is a huge machine and nothing like the gizmos in the “breaker box” that keep your household wiring from overloading, though they have the same function. The one that failed, on a 69,000-volt outgoing high-tension line and dating from 1956, consisted of three big tanks filled with electrical components and oil. Something in one of the tanks apparently wore out, as I understand it, and that caused the entire mechanism to fail and the tank to rupture. Some of the oil spilled and had to be cleaned up. 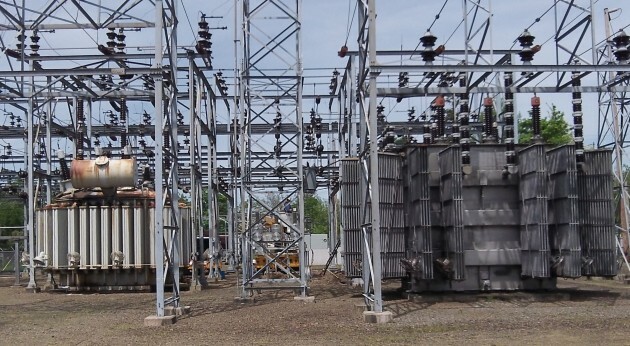 The Hazelwood substation, off the west end of Queen Avenue, receives current on a 116,000-volt transmission line and reduces it to 69,000 volts for further transmission to smaller substations. One of the transformers, I learned on the scene, was built in 1929. Transformers evidently were built to last forever. The breaker failure at Hazelwood caused other parts of the system to shut down, but not all at once. The initial problem occurred at about 4:30 p.m. The Vine Street substation, for one example, went out at 6:06 and was restored at 6:35. All customers were back on by 7:15 as Pacific was able to shift power around its interconnected system. Thanks Hasso, nice to have an update… Ya scooped the DH – again!